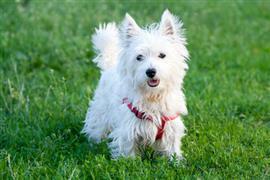 Many typical names among the Westie stem from its characteristic white coat. Names like Casper, Powder, Aspen, and Dove are a few favorites. Almond is a pretty common name that arose from the Westie’s almond shaped eyes. As with many breeds, owners like to seek out names that match their puppy's origins. There are many excellent Scottish names that can be proudly engraved on any Westie’s name tag. Conan, Taran, and Ceana are just few examples. Other well-rooted names come from cities in Scotland like Paisley, Dundee, or Perth. Yet another honorable idea is to name a puppy after key players in the development of the breed. Edward Donald Malcolm, Niall Campbell, and Robert Goelet each lent an important hand in the Westie’s history and would be honored to share a name as well. Some of our pages will contain a subcategory. A subcategory is a slightly more specific grouping than the main topic of the page. For a subcategory, we will include a separated table of names and corresponding descriptions. An example of a subcategory of Red Dog Names would be 'Dog Names Inspired by Red Wines'. If you have any subcategory ideas for the Westie Names page, we would love to hear them. Use the form below to submit your ideas.